Killin is a quaint village set on the banks of the renowned Loch Tay. Lochside walks and watersports are available in the summer months and in the winter the loch is transformed to a quiet, romantic location. With beautiful views of Loch Tay, River Lochay and Falls Of Dochart this area makes romantic breaks and honeymoons in Scotland very memorable. Village pubs offering basic accommodation like the Killin Hotel and Coach House Hotel carry the Highland inn tradition while the The Falls Of Dochart Inn and The Bridge Of Lochay Hotel offer traditional Scottish hospitality and modern comfort in Killin. The Courie Inn is nestled at the western end of Loch Tay, magnificently sited near the scenic Falls of Dochart. Accommodation at The Courie Inn is comfortable and welcoming, with beautiful views and delicious, thoughtfully sourced, cafe and pub dining for breakfast, lunch and dinner. We have a comfortable bar and a separate cafe area for day visitors, and comfortable rooms for tired travellers. Make the most of the comfortable lounge bar's fire on those cold Scottish evenings, and sample a range of speciality beers and spirits. Pop in for a pint or a quick lunch, or stay for a few days and enjoy the atmosphere and beautiful scenery. We offer a range of comfortable and welcoming rooms to meet all of your needs, whether you are visiting to enjoy the great outdoors, to appreciate the local history, or simply to relax and enjoy a romantic break. From our family friendly rooms to the romantic MacDonald Suite, we will have a room to suit you. Our website has lots of information about the local area, activities and events, from walking Tarmachan Ridge to our nearby Munros of Ben Lawers and Beinn Ghlas. Glasgow - Road: Follow the M8 toward Edinburgh/Stirling/M80/Carlisle/M74. Keep left to continue on M80, follow signs for Stirling/Kincardine Bridge, merge onto M9, at junction 10 take the A84 exit to A85. Follow signs for Callander/Crianlarich. From Callander take the A84 to Lochearnhead, this then becomes the A85 – continue to Lix Toll. At Lix Toll garage turn right onto the A827 towards Killin. Edinburgh - Road: Follow the M9 toward Stirling. At junction 10, take the A84 exit to A85. Follow signs for Callander/Crianlarich. From Callander take the A84 to Lochearnhead, this then becomes the A85 – continue to Lix Toll. At Lix Toll garage turn right onto the A827 towards Killin. Perth - Road: Take the A9 and turn onto the A827 at Ballinluig. Follow the signs to Aberfeldy, and then continue towards Kenmore. At Kenmore continue along the A827 towards Killin. Glasgow - Train: The only rail transport close to the Killin area is the West Highland Line from Glasgow Queen Street station to Crianlarich station (14 miles / 22 km from Killin). Edinburgh / Glasgow / Dundee - Coach: Citylink 913: Glasgow – Stirling – Callander – Strathyre – Kingshouse – Lochearnhead – Killin – Crianlarich – Tyndrum – Glencoe – Fort William. Citylink 973: Dundee – Perth – Crieff – Comrie – St Fillans – Lochearnhead – Killin – Crianlarich – Tyndrum – Oban. Citylink 978: Edinburgh – Stirling – Callander – Strathyre – Kingshouse – Lochearnhead – Killin – Crianlarich – Tyndrum – Oban. Situated in the Loch Lomond and Trossachs National Park, in the heart of Rob Roy country, Creagan House is ideally located for walking, cycling and sightseeing. The Baronial style dining room, with its vaulted ceiling and open fireplace, is the focal point of this restored and updated 17th-century farmhouse and a worthy setting for the superb Scottish breakfasts on offer. Attention to detail can be seen throughout Creagan House, including the warm and welcoming bedrooms with free wi-fi, flat screen TVs, high-quality bedding, towels and bathrobes. The lounge is a perfect place to relax and enjoy working your way through the extensive list of malts available to purchase from the bar. Direct from Creagan House, you can climb Ben Shian (Hill of the Fairies). You can cycle along the traffic-free NCN7, or walk the Rob Roy Way. Nearby, for more of a challenge, there are several Munros to bag. In Strathyre village, there is canoe hire, wildlife and historic guided tours, geocaching, orienteering and team building events. Numerous golf courses from the world famous Gleneagles to the scenic St. Fillans are all within an hours drive. It is just a 30-minute drive to Crieff, home of the Glen Turret whisky distillery and ‘The Famous Grouse Experience’. Travelling north on the A84, merge onto the A85 near Loch Earn. After approximately 5 miles turn right onto the A827 towards Killin. Upon arriving in the village, the Hotel is on the right hand side next to the River Lochay. The Bridge of Lochay Hotel is owned and run by Amanda Clark and Bob Stevenson who, along with their team of friendly staff, aim to offer the very best Scottish welcome and hospitality - our motto is 'nothing is too much trouble'. A traditional Scottish Inn - we aim to provide a warm, welcoming and comfortable place where our guests may pursue a range of activities and pursuits in the surrounding area. With 12 warm comfortable rooms, real log fires (when the weather dictates) and superb food using only the best locally sourced ingredients our aim is that you will have a stay with us that will remain with you and leave you longing to return. Our approach is to offer something individual very much run by the owners and our team. This ensures that our guests enjoy a truly unique experience which allows flexibility to meet your specific requirements. Our own brood of free range hens ensure a healthy supply of delicious fresh eggs for breakfast . Our Chefs share a commitment to sourcing local game and seasonal produce, guaranteeing not only seasonality and providence but when combined with their skill also give a truly memorable dining experience. The hotel is the ideal size for small family gatherings and is available for Private House Parties, Small Weddings and other occasions. We can cater for up to 45 people for a sit down meal, however we suggest that if you are interested in holding such an event with us you speak to us when we can best guide you with our capacities and capabilities. The hotel is also available for Exclusive Use. We have recently held Weddings, Birthday Parties, Munro Parties and simply Family Gatherings at the hotel. The Bridge of Lochay Hotel is in a set in the perfect location for you to relax in Breadalbane, one of Scotland's most picturesque areas. The hotel sits on the banks of the River Lochay, Killin, by the bridge that gives the hotel it's name. The hotel sits at the peaceful northern end of the village. Glasgow/Edinburgh - Road: From Glasgow follow signs to Crianlarich along Loch Lomondside. We are approximately an hour and a half drive from Glasgow. From Edinburgh follow signs to Stirling then Crianlarich, taking a right turn at Lix Toll signposted Killin. 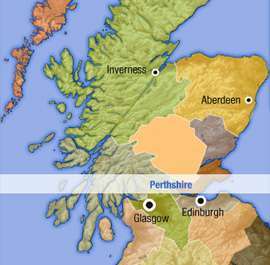 We are approximately an hour and a half drive from Edinburgh. Crianlarich Station - Train: Transport can be arranged from Crianlarich Station to Killin by private taxi if arranged in advance. Stirling - Bus: Buses regularly leave Stirling Bus Station to Callander and then a change to take a bus to Killin. Ben Lawers Hotel in Perthshire offers some of the most fantastic views and is situated in the heart of one of Scotlands most beautiful and accessible unspoilt areas. Places within a 15-minute drive of this 3-star Lawers accommodation include Breadalbane Folklore Centre and Falls of Dochart. Loch Tay, one of Scotland's more peaceful Lochs where you can visit old Lawers Village where the Lady of Lawers once lived or the Crannog Centre. With the most fantastic view of the Lawers mountain range with its 5 Munros and rare Alpine plants, you'll also be just 6 miles from Fortingall Yew. At the hotel's own bar/lounge, you can stop for a drink. Added amenities include ski-in/ski-out access, a snack bar/deli, and coffee/tea in a common area. Free breakfast is available daily between 8AM and 9:30AM. With 5 en-suite bedrooms, food is a big and important part of our hotel. LCD TVs, coffee/tea makers, and hairdryers are featured in all the rooms. Limited housekeeping is available, and an iron/ ironing board can be requested. A827 Aberfeldy to Killin road, 8 miles from Killin / Kenmore. Overlooking Loch Tay. 45 miles north of Perth or Stirling. With one of the most enviable Lochside settings in Scotland, The Four Seasons is a haven of tranquillity, a true ‘get away from it all’ countryside and loch-side retreat set in the heart of Perthshire and on the eastern most tip of Loch Lomond and The Trossachs National Park. Its reputation stretches back to the 60’s when the Beatles stayed and more recently it is renown for its two-rosette restaurant – The Meall Reamhar. An accolade it has enjoyed and coveted for over 20 years. One of the most iconic hotels in the area, parts of the building date back to the early 1800s and whilst originally linked to the local lime kilns, it was converted into a hotel in the 1900s. Accommodationin the hotel comprises of 12 rooms, the majority of which offer loch-side views as well as a two-bedroom holiday apartment – The Vivaldi. There are a couple of four-posters and we affectionately refer to some of our rooms as ‘Narnia’ bedrooms where you enter the bathroom through the wardrobe! The six hillside log cabins positioned behind the hotel also offer stunning views of Loch Earn, whatever the weather. With two bedrooms, these are ideal for families and located in the woods, are popular with pet owners. All rooms offer the home comforts you would expect including shortbread and ‘Bonio’ biscuits as required! St Fillans itself is in the centre of outdoor sports in Scotland, with Comrie Croft mountain bike centre, Loch Earn watersports, fishing, St Fillans Golf Club and numerous Bens to name but a few of the options to consider on its door step. The golf club loans clubs and the hotel loans bikes. Public facilities include the Meall Reamhar Restaurant, (Green Hills) the ideal place to luxuriate with fine food and wine, whilst the wee bar is just that, a snug populated by guests and locals alike catching up on the days activities. This is the heart of the hotel and where dog owners congregate beside the fire whilst taking in the activities on the loch including water skiing, jet skiing and fishing. For those who want to get away from it all, perhaps with cocoa or a brandy and a book, half way up the stairs is the library. Reminiscent of something out of Harry Potter, you can curl up with only a bear watching you! The sitting room is an option for larger groups that want a little privacy, for birthday drinks or the place to meet – it should never be under estimated! Finally there is The Tarken. Offering food from the same kitchen as the Meall Reamhar but in a more informal and relaxed setting, the Tarken offers dining at table or for pet owners at sofas, as well as catering for those guests on the balcony. Under new ownership from July 2017, the hotel is facing a new era, one of keeping the best of the past whilst bringing a new flavour and tone to what is already recognised as a place of outstanding service. One thing is for sure, The Four Seasons will continue to be a flagship property in the area and most definitely will remain pet friendly. From Stirling follow the A84 west to Callander and north to Lochearnhead. Turn East onto the A85 and follow the road to St Fillans. To reach the hotel from the nearby town of Perth, follow the A85 (Crieff Road) west to Crieff, continue west on the A85 and on to St Fillans. Take the long drive up to Cornhill Castle, near Biggar, and you’ll catch your breath when you get your first glimpse of this majestic building. Situated in acres of stunning countryside, overlooking the River Clyde and to the hills beyond, this is a jewel in Lanarkshire’s crown. Private and secluded, it’s a magical escape into a Scottish fairyland castle. All rooms are large, comfortable and beautifully decorated, many offer stunning views of the surrounding countryside. A Grand Ballroom boasts huge glittering chandeliers, a large dance floor, a state-of-the-art sound system and exquisite décor. The doors to the Grand Ballroom open out into the vast gardens and to a decking area where you can relax and enjoy the views. Cornhill Castle features in many dream wedding venue lists and it also includes a stunning honeymoon suite located in one of the original castle turrets which occupies three levels. This beautiful suite has its own Jacuzzi bath, sauna, rainfall shower and viewing area. There are excellent dining options in the restaurant which enjoys gorgeous views, and there are also sitting rooms while you can relax and enjoy some afternoon tea. Families can take their children on the Cornhill Castle Nature Trail, while the historic town of Biggar is only a short drive away. It’s a perfect escape from the city but it’s also within equal reach to both Glasgow and Edinburgh. Business guests can make good use of the quiet solitude for brainstorming as the Grand Ballroom can also accommodate a large conference. There’s a total of 12 rooms and there’s also a helipad for guests wishing to arrive by helicopter.